The 121 Red Arrows Drill Team is a marching unit that performs routines based on military drill. Continuous weekly practice allows the team to perfect their proficiency and compete against other teams from their region. Should they succeed and win the regional competition, the team then moves on to the provincial competition. There are two divisions for competing, Drill Without Arms, and Drill With Arms. The rifles carried by the Drill Team With Arms are real however they have been deactivated and made safe for the cadets to use during their practices and competition. Another component of the Drill Team is dress and deportment. It is expected that the cadets on the Drill Team keep their boots polished and uniforms in top shape. 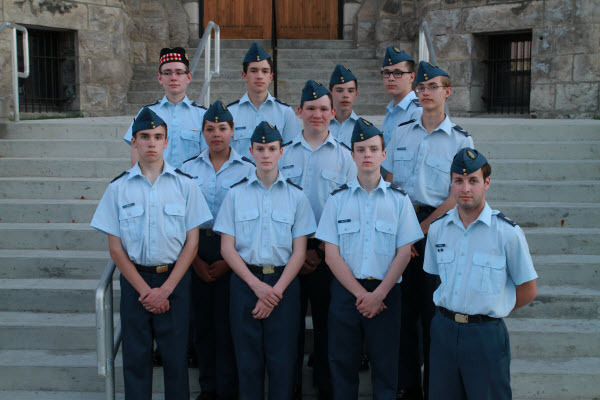 While all cadets are welcome to try out for the Drill Team, only 16 member can be taken to competition as set out by the competition regulations.